Sterling Printing specializes in printing and signage needs for convention and trade show exhibits nationwide. 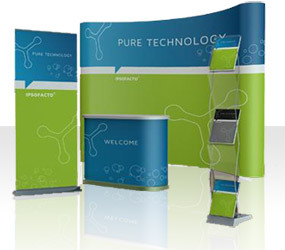 We have designed a comprehensive set of convention printing services to provide tremendous value to exhibitors. Whether it is pre-planned and your organization has plenty time to prepare for it or if this is an event and you need a super rush service, we are here to be of help. Union bug/label available on most items. Our over 30 year history allows for quick turnaround times and capabilities suited to serve the needs of large and small exhibitors. We are located only a few miles from all of the Greater Boston's convention centers. We deliver directly to your hotel or convention center. Convention Printing Services-super rush service available! If there is enought time, please feel free to go thru our online catalog below. If not, we will use in-stock items to print for your event. The Exhibitors’ Handbook® offers one of the widest ranges of portable display products, fabric structures, modular exhibit solutions, display accessories and related graphics. From banner stands, portable signs, popup displays, tension fabric displays to literature racks, lighting, display cases, table throws and more, The Exhibitors’ Handbook is a one-stop-shop for all types of exhibit and display solutions. Please check out what is available on this link and email us for more information at sales@SterlingPrinting.com. table cover or throw, retractable banner stands, banners, posters and most important inexpensive giveaways.